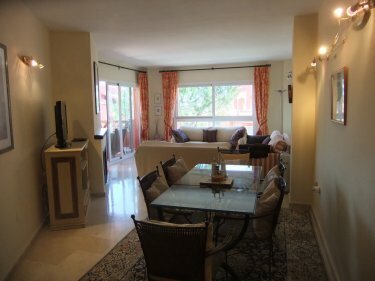 This spacious, beautifully-presented apartment in a superb location is ideal for couples and families looking for a high standard of accommodation. 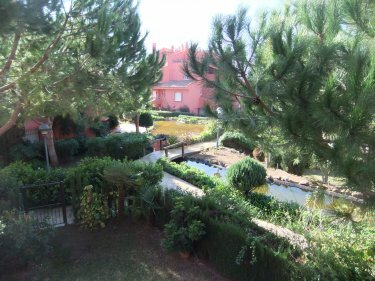 This apartment is in the town of Elviria, a community located about 15 minutes east of Marbella's city centre. The apartment is in a gated community with such amenities as a large communal pool, landscaped gardens, lifts and underground parking. The apartment also has hot and cold air conditioning. 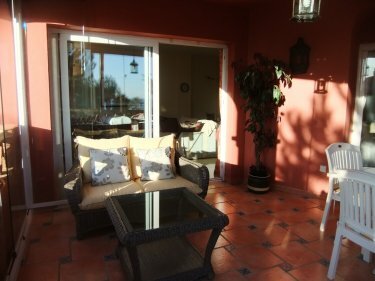 The lounge/dining room seats 6 people comfortably and has patio doors to the main terrace overlooking the lovely gardens and sea view. The terrace comes with a sofa and patio furniture. The kitchen is fully tiled and fully fitted with a cooker/hob, microwave, fridge freezer, washing machine, dishwasher, toaster and kettle. All of the bedrooms are tastefully decorated with beds, night tables, and wardrobes. There are two double bedrooms that can sleep four people comfortably. There are 2 fully tiled, luxury bathrooms, one en-suite to the master bedroom. 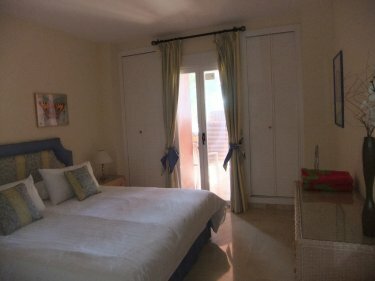 This apartment in Elviria is just a short walk to The Beach House Restaurant and Nikki Beach, one of the most glamorous beaches on the Costa del Sol. For golf enthusiasts, the apartment also provides easy access to the finest golf courses in Europe, the closest being Santa Maria.